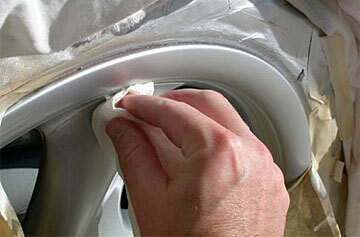 Restore alloy wheels to look like new. Wheels can be damaged by potholes, curbs and auto accidents. Wheel repair is a convenient service that can save you from the high cost of wheel replacement. Our skilled technicians professionally restore alloy rims by using the latest technology and innovative techniques. Our professional refinishing process can restore them to look like new. We also provide custom cosmetic refinement. In many cases, Wilde Bodyworx’ technicians can restore your wheel to its original finish at a fraction of the cost of a new original equipment alloy wheel. If your wheels are bent or broken, driving on them can create vibrations that cause undue stress to vital suspension parts and potentially cause unsafe driving conditions. As a result, many manufacturers strongly recommend to replace bent or broken alloy wheels, rather than attempt to repair the damaged alloy wheels. Our auto repair technicians will inspect your damaged alloy wheels to determine whether the wheels can be repaired, or whether the wheels need to be replaced. This inspection is at no cost to you. We will only repair damaged wheels if the repair can be made in a manner that is consistent with manufacturer service guidelines. If the damaged alloy wheels need to be replaced to ensure the safety of your vehicle, our collision center has a wide selection of alloy wheels and the expertise to make the replacement promptly to restore your vehicle to pre-accident condition.